For over 25 years, Steve Linden has been serving the needs of classic car collectors, enthusiasts and investors. His wide range of services will help you get the most out of your passion for vintage automobiles. Protecting your investment with a comprehensive Vintage Car Appraisal is a vital part of the ownership experience. Steve makes it easy to get an appraisal that is thorough, accurate and reliable. Visit his appraisal page. The most important step in the purchase of a collector car is a pre-purchase inspection. Whether you're a seasoned collector or a first time buyer, a pre-purchase inspection should be considered mandatory before making any classic vehicle purchase. Learn more. Check out the great selection of classic cars, motorcycles and other great rides for sale by Steve Linden. Make sure to check back often—you may just find the vintage beauty you've always been looking for. Browse the inventory. “Car Collecting—Everything You Need to Know” is the definitive guide, and Steve’s extensive experience will educate, inform and entertain. Available at fine bookstores. See Steve on the BBC Discussing the World of Super-Rare Care Investing. Watch Steve on Fox Business News Discussing Classic Cars as Investments. As a winning qualified expert witness, Steve brings the needed expertise to your legal team when litigation is necessary. Steve also offers a wide variety of ﻿consulting services﻿ to individuals, museums, corporations and more. Whether you have identified a particular car for purchase, or if you want us to locate one for you, we are ready to serve you. 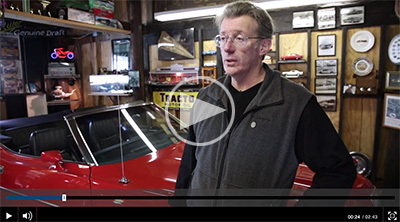 Learn about Steve's vintage car export services. Steve's Classic and Vintage Car Blog is a treasure trove of information pertaining to classic cars. If you're an enthusiast interested in the classic car hobby, be sure to visit often and browse the archives for helpful advice on everything from classic car values, restoration tips, to maintenance solutions and so much more. Read the Blog.